5: Relating to Research On the Historical Moses? In all ancient Mediterranean civilizations the constellation known to us as the Pleiades had a most important role. It served as a celestial marker or sign for one of the year's great events, i.e. the springtime's arriving rain or flood. In fact, these stars were thought to be connected, in a meta-astrological sense, with the concept "blessing". Thus the Pleiades were signaling and initiating "the wet season" which then became more enhanced by other signals from a next following star group, the Hyades, in Greek 'to rain'. Later in antiquity, Greek and Roman authors enjoyed to write about the especial popular stellar group of the Pleiades, to which there already existed several mythological accounts. For instance, the Pleiades group is depicted on the ancient Egyptian vizier Senmut's 3,500-years old star map - i.e. these stars are placed on the map precisely as the location where the Pleiades are situated in the sky. More so, on the map the specific picture have been attached some hieroglyphs showing clearly to be read in the direction from the right to the left, displaying the name mw(jt) nwt ht , i.e. 'the watery bodies', 'the humids', or '...of moisture'. - And, as very often in Egyptian texts, it also may have an additional interpretation: 'three parts of Nut's body (in the sky)'. The now so famous Senmut map is adorning the ceiling of his tomb (Thebes Tomb 353, at Deir el-Bahari, near Luxor) which like a tunnel is leading beneath Queen Hatshepsut's Temple of Hathor, goddess of the sky. However, a certain analysis of the map reveals such kind of information being of greatest importance in connection with the history and chronology of Antiquity - cf. below, the sections 5 and 6 - the detection was made by Ove von Spaeth. His discovery was first published in 1984 (in the Magazine 'Stjernerne') - and later added further scientific details, now published as the treatise: "Dating Egypt's Oldest Star Map", in "Centaurus Magazine of The History of Mathematics, Science, and Technology" (Vol. 42:3, July 2000, pp. 159-179). Some of the Egyptian temples have been constructed in a way connecting to the star of Sirius when - each year in the summer after a period of invisibility of 70 days - Sirius rose together with the sun (i.e. Sirius's Heliacal rising) that the light would travel down the temples' main corridor and reach the innermost sanctum of the temple. Here, Sirius would in that moment place its light at the altar, and this light from Sirius (Sothis) was then considered as being transformed into Sobdet which is the name of Sirius as Egyptian star god. This divinity was a special version of Isis, the greatest goddess. Also, it is the case with the Egyptian temple of Isis in Denderah, a temple build as a copy of more ancient temples. Similary here when the altar was lighted by the beam, the star Sirius (Sothis) was thought to be transformed into the divinity Sobdet. For instance, this is the case with the Egyptian temple of Isis in Denderah, a temple build as a copy of more ancient temples. When the altar was hit by the beam, the Sirius star was thought to be transformed into Sothis (Sirius) as a star god, i.e. special version of Isis, the greatest goddess. On the basis of the same understanding a similar principle was already involved in connection with previously mentioned Hatshepsut's Temple of Hathor, which with its axis directed at the line of winter solstice (cf. below: section 3), even also could receive the beams of the (in the mythology: seven) Stars of the Pleiades. This was interpreted in a way that the light consisting of the seven beams were being transformed into the Egyptian celestial goddess Hathor's seven female judges to judge mankind. In a similar way later in Greek temples - for instance in the very Parthenon - being constructed with the direction to the beams of the Stars of the Pleiades. Thus, when the temples were oriented geographically to receive these beams of light into the inner sanctums, the light-rays were described in a symbolic way as being "transformed into seven women", i.e. 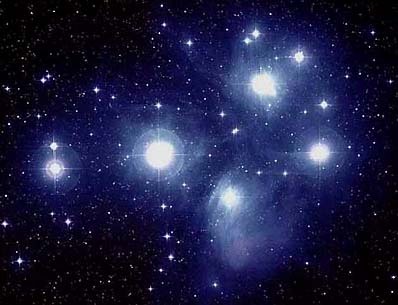 "The Seven Sisters", The Pleiades. The Greek scholar, philosopher, and astronomer, Eratosthenes in Alexandria (276-194 BC), was the director of the famous, enormous library of Alexandria and having admission to huge amounts of knowledge, and he described the Pleiades as "the seven stars of which the one of them is not visible". Already the Greek writer Hesiod states, ca. 700 BC, that according to the old star lore this group of 7 stars represents the 7 daughters of Atlas (also known as the giant who carried the very sky globe on his shoulders). Even though we can only see 6 Pleiades in the sky it is a fact that all the way from Greece throughout to the South Pacific, and - notice - also in Pre-Columbian North America, accounts everywhere tell about "the seven stars of which one is gone". Gajus Julius Hyginus (64 BC-17 AD), Latin author and the appointed (by Emperor Augustus) head of the Palatine Library, writes in his work "Astronomica" (Poeticon Astronomicon, 2.21): "... Pleiades are called seven in number, but only six can be seen ...". Around the world, in many countries and localities, - which in prehistoric times may appear to have had some kind of connection - this constellation is, in addition, often called "the young women" or "girls". The star cluster was also seen in this way by the ancient Hebrews - as well as by America's Coyote Indians in Oregon and the Iroques Indians. Also by e.g. the Dyaks and the Malaysians on Borneo these stars are exactly counted as "seven of which the one is invisible". And by Australia's Aboriginals who, too, call them "the young girls". They are called by this name, likewise, on the Solomon's Islands in the Pacific. And on the Northern Sumatra this 6-star constellation is called "Bindtang Tudjohc", i.e. 'of the 7 stars". All this could refer to a much older age of the concept of the star system than most historians today would like to accept. Ancient, widespread civilizations of prehistoric times - being traced and discovered more and more by modern science - could have existed several places on earth. And from some of these connections the Hebrews, the Greeks, and the Egyptians seem to have possessed such a heritage - "the 7 young women", "the sources of blessing", "the humids" - and have carried it further on. The biblical Job text - mostly in archaic Hebrew and 3,500 years of age - could contain an extra allusion. It may be showing a lingering loss of the 7th Pleiad which apparently failed to remain being fixed on the firmament: "... Canst thou bind together the brilliant Pleiades? ..." (Book of Job, 38:31). Illustrations. Below: The stars of the Pleiades cluster as depicted on ancient Egyptian vezire Senmut’s star map. In all ancient Mediterranean civilizations the Pleiades were important in use in the agricultural calendars. 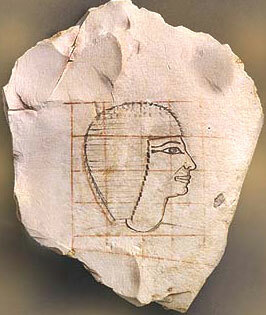 Further below: Senmut portrait placed in a contemporary Egyptian craftman's projection grid to be used as a model for decorating Senmut's tomb. Transatlantic versions of constellations: It is a fact that reminiscences of our well-known zodiac system were found with the Mayas - prior to the arrival of the Spaniards in Central America in 1492. Thus, several of their star sign symbols are in principle identical with the ancient Middle East zodiac symbols. As with the prehistoric world's widespread, common ideas on the Pleiades something similar is seen also regarding the constellation Ursa Major, i.e. Great Bear. This constellation of its own seven-star-group, also known as Charles's Wain, is a non-existing tail-bear - strangely enough known all over the world. This is except on the Senmut star map where it is shown in quite another version. Yet it has still been placed correctly - near the top of the celestial World-axis. This axis was the most famous celestial line of sight - connecting the brightest main stars Canopus, Sirius, and Lyra/Wega. The axis is, possibly emphasized for the very first time, depictured on the Senmut map. (More about the axis, cf. the following page). This axis is the most famous celestial line of sight - connecting the brightest main stars Canopus, Sirius, and Lyra/Wega. The axis is, possibly for the very first time, depictured on the Senmut map. Europeans, Asians, as well as the North American Indians prior to Columbus all perceived the constellation in question as the picture of a bear. In many cases they had the same designations for the same constellations; and concerning Great Bear, in the different continents with their several local languages, this same group of stars was called by the same designation, the "Great Bear", which is remarkable as it does not at all look like a bear! And this is even a bear with a long tail - non-existing in any earthly zoological issue or concept - i.e. an identical "fantasy" product re-found across the oceans. The above mentioned idea (cf. Section 1) about a past "intercontinental" range of even several cases of identical names of stars/constellations seems not only based on an apparently wide spread knowledge of a principally uniform astronomical system; especially with matching identical features in the symbols of the 12 sections of the zodiac. Such "agreements" also concern several other identical astronomical names or descriptions. For instance, this is the case with the sun, called 'Ra' or 'Re' by the Egyptians; the Chinese called it 'Re', and so did the Polynesians. And all over the Pacific Ocean it is also called 'Ra' - despite the lack of relation/affinity between the Egyptian, Chinese, and Polynesian languages - and irrespective of the huge geographical distances. To this it should be added that apart from the almost identical pronunciation of Ra/Re (Ri), the Chinese still use in their special writing the very same pictographic sign for the sun as the Egyptians. It is the well-known ancient symbol of a circle with a dot in the middle (in later Chinese pictography the circle has been changed to be square-like, for reasons of a calligraphic writing technique). The Egyptians' hieroglyph for Re or Ra, 'the sun', (here, together with a glyph meaning 'son of Ra') - and in China the sign for Re or Ri, 'the sun', (and a later, square version more easy to write). When, for example, children make drawings of a sun it is always just a circle - possibly equipped with rays or a face - but never a circle with a dot in the centre. The very specific sun symbol consisting of a non-empty circle contour and "characteristically made" with its centre-dot as the 'core' is therefore no coincidence when it is found in the same special form both with the ancient Egyptians and the Polynesians, and in the Chinese script as well. Similarly, both the ancient Egyptians and the Chinese have a glyph or symbolic sign showing a scorpion. According to the ancient traditions of astrological significances, for instance in use among the Greeks and the Romans, the celestial sign of Scorpio (originally the constellation named Scorpio) may symbolize or refer to "huge quantities or numbers"; and when a picture of a scorpion is used as a hieroglyph in an Egyptian text - or as a writing sign in the Chinese writing still used - this also means the same thing in both of these written languages, i.e. "huge numbers". In the same symbol concept at all the places the by nature toxic Scorpion signified also something concerning death, and America's Mayas called this particular constellation "the sign of the god of death". Also the stars known by us as the Gemini have the same Greek and Babylonian name or meaning, which is also the case among the ancient inhabitants of the southern Pacific Ocean. Heritage from earlier civilizations? Archetypes? For all these examples too it goes that the concepts and designations they had in common are hardly each time just a coincidence, but could indicate a form of transport of traditions, for example, via the ancient seafarers, who, all over the world at all times navigated by means of the stars. Thus, the spreading of some of the mutual ideas could also have been done in this way; although not necessarily as the only way. In this connection it is interesting that the ancient Egyptians did not call the constellation in question Great Bear, but Meshkitu, i.e. the 'shank of an ox'. In ancient myths, and also in the Bible, a shank, thigh, or loin refer conceptually to the delivery process or re-birth and were also well known euphemisms for the reproductive organs. In the Senmut star map and in numerous other ancient Egyptian pictures the Meshkitu - the constellation of the Great Bear/Charles's Wain - has been made unusually flat. When the Egyptian mythological tradition seems to have many references to a previous civilization - could the idea have been faithfully passed on from that? Illustrations. Below: - Left: The Great Bear constellation on many Egyptian pictures. - Centre: the constellation's movements thousands of years ago. 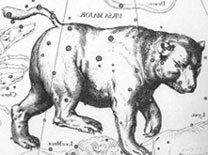 - Right: the constellation shown as a bear with the unnatural tail (Beyer's map from the Renaissance). A large part of the basis for the Senmut-map is deeply rooted in ancient Egypt's astronomical traditions - which now appears more comprehensive than hitherto acknowledged - to which the following examples, although not directly related to his star map, are showing an advanced capacity and versatility. Ancient civilization's collected experience concerning the starry sky, which included astronomy, celestial geometry, astrology, and time measuring was an especially important issue in a comprehensive knowledge thus existing in the societies of the past. In Egypt from very early times an observatory was known at the top of the shrine for the Moon-god's son Khonsu in the temple of Karnak/Thebes. Even from the very ancient times astronomical lines of sight were used as placement plan for the axes of the temples' constructions. Ramses II's rock temple at Abu Simple has been arranged so that the sun's light every 22nd October enters through the very long corridor following the temple's central axis and reaches completely out at its end and lighten up this pharaoh's statue which is extremely precisely placed here. Many of the temples were, so to speak, lined up also according to the stars - thereby the intension was supported that the both worlds were united. These conditions were created very consciously because we can see that the temple constructions added on through millennia change direction a bit according to the celestial pattern continuously very small changing (via the "the precession") through time. The special, geometrical patterns of lines of sight to important stars, found by measuring the sky, were assumed to be like reflected in the terrestrial geography. The connection with "the mark from cosmos" can be recognized in the biblical statement "as in heaven so on earth". Even at the construction of the three great pyramids of Giza at 4,500 years ago the constructers were intrigued by the stars. When observing the pattern of the constellation Orion - the central part is the 3 bright stars known as "Orion's Belt "- the ancient astronomers are believed to have identified a related situation here and used this star system as a template for the geographical layout of the three great pyramids at their particular location on the building area. Among the Egyptians the sky-related version of the death-and-resurrection-god Osiris was Orion, who especially was involved with the pyramid cult of the dead. In addition, the pyramid buildings' specific mutual relations in their positions on the ground were so precisely carried out that it fully corresponds to the ideas of ancient tradition that these pyramids in their earthly - geographically - circumstances constitute "a mirror image of the sky". Researchers Robert G. Bauval and Adrian Gilbert points out in their book "The Orion Mystery" (1994) that the dead cultic Egyptian pyramids in Giza were positioned at the Nile so that they were corresponding to a (mirror) image of the Orion stars - relating to the god of the deceased, Osiris - at the celestial "river" of the Milky Way. Critics reject the whole thing as "a coincidence" and allege even that the pyramids' location having a reversed orientation relative to the constellation, but these critics apparently do not know that a mirror-reversed image of a constellation - i.e. as a direct projection of the image from the sky and down to the ground - was a frequently used tradition everywhere right up to a few hundred years ago. Thus, from Antiquity the famous statue of Atlas is seen bearing on his shoulders the celestial sphere with all the constellations facing towards the Earth and turning their backs to the viewer - and in the same way on the star maps later in the Renaissance. 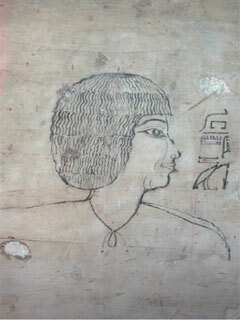 Even the Egyptians almost never showed the constellation figures in front but mostly in profile. The notion that these pyramids are in correspondence with the sky, is also demonstrated to be probable in particular by the fact that the pyramids in the ancient inscriptions can be seen explicitly called "the pyramid which is a star" - according to the British Egyptologist Toby Wilkinson, Cambridge University ("The Guardian", May 14, 2001). Moreover, it is in particular known that in general the Egyptians also looked upon the Nile and its course from south to north as a reflection of a dominating celestial image, the Milky Way. "... the entire Egypt is as a mirror image of the sky ... transferred from heaven down to earth ..."
Concerning the placement of the three Great Pyramids it seems not only to have been arranged to reflect the three stars in Orion's Belt, but it is a fact that also the so-called airshafts in the Great Pyramid are pointing, in an exact angle, in particular to Orion and other selected stars. Furthermore, these three pyramids have been built with the most incredibly exact celestial line of sight towards the North Star, i.e. at its position at that time. Kate Spence, the British Egyptologist, published a brilliant, although disputed, article on that method: "Ancient Egyptian Chronology and the Astronomical Orientation", in "Nature" 16 November 2000 (Vol. 408, No. 6810, pp. 320-324). The constellation Orion's belt of 3 bright stars might have inspired to the location of the 3 pyramids. To the right: a part of Senmut's star map with the 3 stars highlighted. Also ancient temples were considered literally as a holy piece of heaven reflected into the geography on Earth. For instance, the ancient Babylonians/Assyrians directly referred each of their major cities to certain stars - e.g. Nineveh (cf. "Book of Genesis", 10:11), the city's name meaning 'wild boar' also being the totem of this city and a name of the constellation "The Boar" (our Great Bear/Charles' Wain). Another example of their concept of a sky-earth-mutual-reflection is that with their sky-yardstick the Babylonians measured degrees of arc by use of a certain terrestrial measure, "the royal cubit". Through their many years of archaeo-astronomical studies, researchers Robert Bauval and Wayne Herchel independently of one another detected (in 2005-2006) that the ancient Egyptians used even very accurately the little group of pyramids in Abusir - which is located exactly on an extension line from Giza - to represent the Pleiades on this "celestial map on the ground". Concerning the three great pyramids at Giza the researcher on history, Robert Temple, has disclosed by meticulous measuring and observation disclosed that during the days around December 21, i.e. exactly around winter solstice, the pyramids cast shadows on each other. And in particular that such a special winter solstice shadow will be cast on the southern surface of the largest pyramid (cf. Robert Temple: "The Crystal Sun", London 2000). The pyramid silhouette of this "rare" shadow has an angle of 26 degrees and 34 minutes -exactly like the slope of the ramps (for instance "the Gallery) inside the very pyramid. This definite 26 degrees angle is part of the "golden" right-angled triangle with sides in a ratio of 1 to 2 and a corresponding square root of 5 which in particular is connected to "the Golden Section". This concept was especially important within the almost religiously sublime geometric science of ancient times - and was here the canonical basis of Egyptian art and architecture. 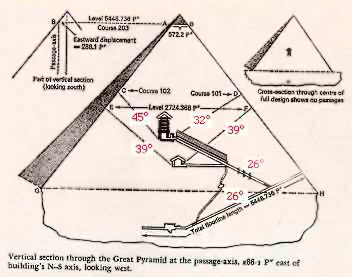 Illustration, below: The ramps of the interior of the pyramid with the 26 degrees tilt (26:34 degrees). The clues for understanding the build-in information in the Senmut star map should be based on knowledge about the special Egyptian astronomic-cosmological concept. The ancient temples constitute or represent "a part of the sky" placed in the terrestrial world. The temple of Queen Hatshepsut was built 3500 years ago in Deir el-Bahari west of Luxor, and Senmut, the Grand Vizier, who was also a brilliant and innovative architect, had engraved in the foundation stone a kind of horoscope for the foundation of the temple (according to French Egyptologist Suzanne Ratie's work "La reine-pharaon", Paris 1972). It is also established that Senmut has arranged the building in such a way that a long line of sight of several kilometres pointing from the central axis of the large Temple of Karnak (in northern part of present city Luxor) and further crossing the Nile and all the way out where it eventually is united with the central axis of Hatshepsut's Temple of the Egyptian sky-goddess Hathor - at the mountain ridge in front of the Valley of Kings. The deviation of the line of sight is accurate to less than 2 degrees. The axis is discussed and depicted in Ove von Spaeth's book-series on Moses, Vol. 2, "The Enigmatic Son of Pharaoh's Daughter" (chapter7). The prolonged axis or special line of sight, i.e. a narrow belt of sight more than a 'cord' in particular, is not heading directly east-west, but has a little wry angle to this, however, the main direction is the very same. Only few know about this axis, and less than few that it has been designated a special meaning or intension. The meaning can be disclosed by combining the various accessible data. Thus, the geographical angle of this axis will state that in reality it is placed directly at the very line of winter solstice. This can be observed, concretely, at the very site: the sun will appear at solstice on the shortest day of the year - approx. on December 21 - which was important, because at this special turning point the length of the days will again begin to increase. And in Luxor (Karnak) the passage of the sun will follow exactly the central axis of the Temple of Karnak in east and further on. On that particular day it is possible to track the sun in the morning, when it rises precisely in the centre at the end of the "main street" of the Temple of Karnak, where the sun beams hit in a special, brilliant way without "wry" angles. (For instance, Ronald Lane Reese, Professor in Physics and Astronomy, at Washington and Lee University, have also noted some of these features, cf. 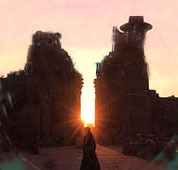 his article: "Midwinter Sunrise at El Karnak", Sky & Telescope Magazine, March 1992, pp. 276-278). It was of great significance that with this date the point of the year was reached when, simultaneously, Sirius - always considered by the Egyptians to be the most important star (and is always followed by Orion) - was "born" (as they called it) here, down by the horizon. In Egypt the star Sirius can be seen in the sky most of the year - and at this exact time to which relation the temple axis had been constructed, a special correspondence was understood between the sun and Sirius. Because here, exactly at winter solstice, Sirius can be seen appearing above the horizon at sunset. Ancient Greek sculptor, Phidias, also painter and architect, ca. 480–430 BC, is regarded as being among the greatest of all Classical sculptors. His famous work, the seated statue of Zeus, 12 metres tall, occupied the whole width of the aisle of the temple in Olympia built to house it, and was one of the Seven Wonders of the ancient world. The gigantic, precious sculpture of ivory and gold-plated bronze was made in Phidias' huge building erected for that purpose at the site of the temple. The point here is that the ruins of this workshop still prove the old knowledge as the building was placed precisely parallel with the line of sight used for the construction of the temple itself - in order to shape the statue for receiving the cosmic light in the very best way exactly as it would appear in the temple. Incidentally, additional significance may be attached to such a type of axis. If we look at modern architects' and surveyors' measures of the ruins in Tell el-Amarna, the town Akhetaten founded by Pharaoh Akhenaten, approx. mid-14th century BC, it appears that there is a similar line of sight following the central axis of the temple and the town and further crossing the landscape out to certain mountains, which are being passed by the sun at the terminal point of its diurnal arc. This construction seems to copy the principle of Senmut's (subterranean) tomb placed in front of the mountain at the end of the long line of sight, which in Luxor/Thebes has its point of origin in the axis of the temple of Karnak. Furthermore, on the latter mountain's rear side (i.e. 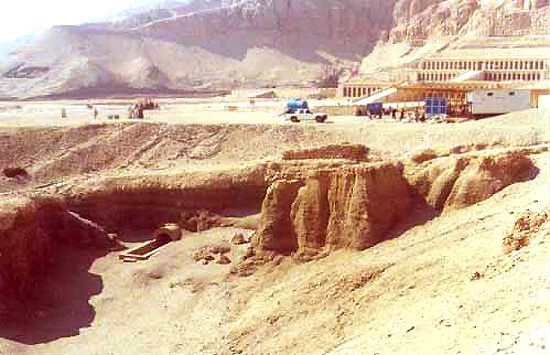 the Kings' Valley) is situated a tomb, prepared for being shared by Hatshepsut and Tuthmosis I, placed directly in the further extension of this line. Everywhere in the old world the axis of winter solstice was of major importance. For instance, it is the very recognizable base of the whole structure of the Ale's Stenar, the 'Nordic Stonehenge' in Scania, Sweden. Six step pyramids of black volcanic stone - situated near Guimar on east coast of Tenerife, the Canary Island - were found in 1990 by explorer Thor Heyerdahl. These pyramids' main complex discloses a perfect line marking the axis of winter solstice. In 1997-1998 archaeologist Donald Ryan have excavated underneath one of these pyramids and found ostracon and obsidian-made tools from the island's original pre-Spanish people, the Guanches, tracing back at least to 6th century BC. British astronomer, Sir J. Norman Lockyer (1836-1920) - among other things famous for the discovery of the sun's chromosphere and the element of helium (in the sun), and his foundation of the famous scientific journal "Nature" - calculated the astronomical lines in ancient Egyptian major temples. He discovered that they all followed such celestial lines of sight and that even later temple buildings changing direction according to later changes in the stellar arrangement in the sky. 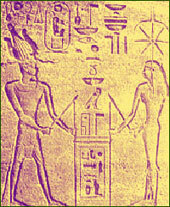 He discovered in the temple inscriptions that the sacred Egyptian ceremony Streching the Cord ceremony was the very description of creating sacred alignment with the celestial lines of sight, especially the axis of the winter solstice, thus making the temple foundation and layout in harmony with the cosmos. Lockyer also measured Greek temples and got the same results - nobody before him had seen and analysed this major coherence between astronomy and the temples through the ages. And the same principle at Stonehenge, too, where Lockyer also dated its construction by again using the fact, that the lines were adapted according to a previous angle of tilt of the axis of Earth. Modern C-14 measuring confirms the dating results about the early time. And especially the Stonehenge axis of winter solstice shows its major importance in the whole arrangement of the construction. of the Cord ceremony - for the astronomical orientation of the temples. From a wall block in Hatshepsut's Red Chapel, in the Karnak temple. In the year 2000 the world's oldest known star observatory was found at the German town Goseck, approx. 180 kilometres southeast of Berlin. The neolithic circular construction shows a diameter of 75 metres, and by all methods it is dated to more than 7,000 years of age, i.e. older than even Stonehenge. Cf. Madhusree Mukerjee: "Circles for Space. German 'Stonehenge' marks oldest observatory", Scientific American (8th December 2003). The observatory has three gates - to the south-east, the south-west, and the north - precisely placed according to the axis of winter solstice. Standing in the centre at the time of winter solstice - and only then - the observers thus could see the sun raising and its setting. Some traditional views by science have been surprised that neolithic people measured the celestial elements to such an extended exactness and so early in history. Concerning the Senmut map adorning the ceiling of his subterranean tomb's tunneling room on its way beneath Hatshepsut's temple - in fact, the very star map was planned to be in line with this tunnel of more than 100 metres. 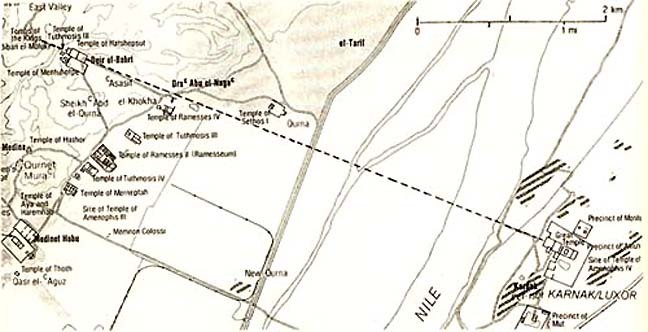 This line is following the direction of the winter solstice axis connecting the Karnak temple with Hatshepsut's temple several kilometres away. Illustrations. Below: The line of sight: The Karnark's temple-axis, early in the morning on the day of Winter solstice, every year when around 23rd of December. Further below: The line of sight: from Karnark's temple-axis via Deir el-Bahari's temple-axis and and further over to Hatshepsut's and her father Tuthmosis I's combined royal tomb in the Valley of the Kings. The deviation in the precision of the line of sight is less than 2 degrees of arc. Below: Pharaoh/Queen Hatshepsut's temple at Deir el-Bahari built by Senmut, vizier and chief architect of Egypt. 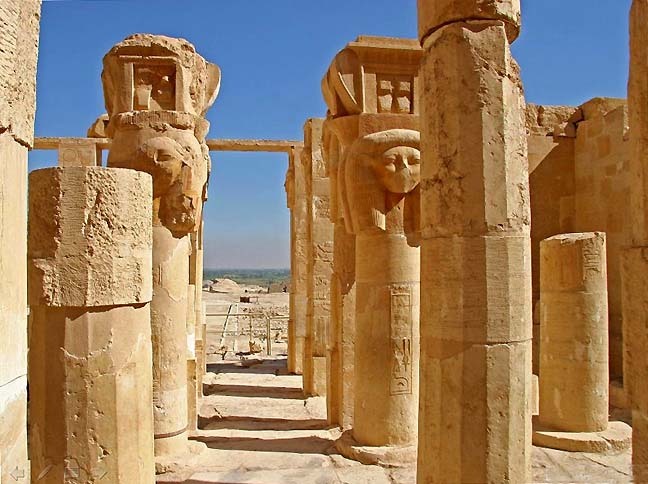 From the upper temple terrace with the the goddess Hathor pillars, an excellent view follows a straight line through some kilometres to the Karnak tempel at the River Nile. 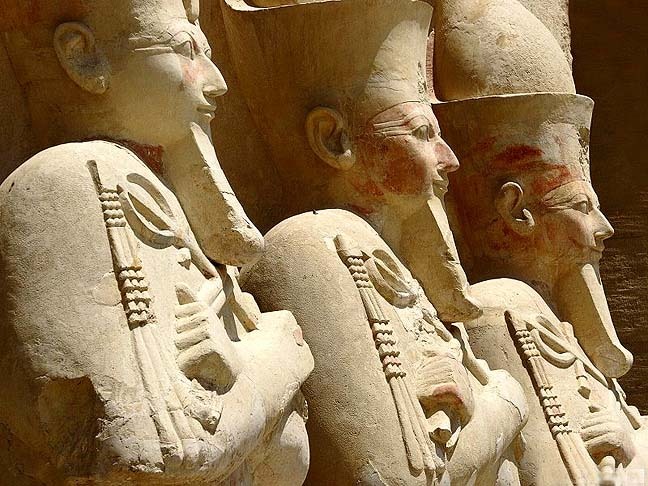 statues at her temple at Deir el-Barari. Apart from the analysis: A possible relation to Moses? The earlier mentioned analysis of the Senmut star map carried out by Ove von Spaeth follows its own objective purpose: to be concerned only with the very dating of the ancient Egyptian star map - and without any dependence of how the result could be used in other connections. Apart from this investigation, - by a totally separated research - the many data on the Senmut map have interesting perspectives: - The precise astronomical dating of the star map implying an enhanced concept of the chronology, which will also contribute to the new orientating research on the historical Moses as presented (cf. Ove von Spaeth's book-series). In addition, Ove von Spaeth's treatise, published in "Centaurus" (42;3, 2000), with documentation for the dating of Egypt's oldest star map, has been re-edited to be used by readers without professional astronomical knowledge. It has been attached as an Appendix to the Volume 2 of Ove von Spaeth's present book-series on research of the historical Moses. The material indicates a special date is signified in the star map. The same date seems to appear in the Rabbinical Writings informing about a specific event for Moses in Egypt. In addition to this, the possible cross-reference between Egyptian and Israelite history has been demonstrated in the series' Volume 2 (and in Vol.1 as well) and the result seems to be supported further by several important relations in this area of research. The Centaurus-publisher's part of copyright to publish the treatise of the star map has most kindly been excluded for the benefit of presenting the text in connection with Ove von Spaeth's Moses-research. The treatise was thus also allowed being published as an appendix to the Volume 2 of this author's book-series "Assassinating Moses". Illustrations below, left: Portrait of Senmut, a contemporary ink-drawing. 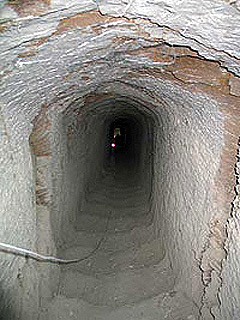 Right: a staircase in the long tunnel of Senmut's secret tomb beneath the temple ground. The combination of archaeology and the rare but informative data from ancient astronomy - together with Egyptology and textual research - is a basic way to a better understanding of some of the great enigmas in the history of the past. These conditions have brought light to what seems to be the existence of a special connection between the Senmut star map and the Moses era, this being discovered by Ove von Spaeth's researching. In his five-volume book-series "Assassinating Moses" Ove von Spaeth has most carefully analysed and published a great amount of ancient traces and highly important clues of the historical Moses. This task has been thoroughly supported by the author's substantial basis of historical and astronomical learning and experience. In his many years of intensive studies Ove von Spaeth has, furthermore, made extensive use of research into archaeology, anthropology, ancient languages, history of religion, Egyptian tradition as well as the ancient teachings of mystery and mythology. He throws new light on the unusually abundant and also controversial material, and even using holistic angle. It is in this context that Ove von Spaeth has meticulously investigated the chronological background, in order to obtain a considerably better precision concerning the historical time-frame of the era in question. "Concerning Ove von Spaeth's momentous, new-orientating treatise on "Dating the Oldest Egyptian Star Map" which was published in "Centaurus International Magazine on The History of Mathematics, Science, and Technology" in 2000 (Vol. 42:3, pp. 159-179): - a scientific pioneering work which has gained sustained admiration and respect internationally for its non-traditional observations and for finding solutions to the special difficult problems of key importance to the ancient Egyptian astronomy and the chronological perspectives. - In addition, the actual findings have furthered research on rendering more accurate the dating of Moses' historical period." "Already the overall picture in this book - of the detection of some radical circumstances behind Moses' role in the history of Egypt and the Hebrew people - is extremely exciting in itself. Rightly, Ove von Spaeth has chosen a vivid style in order to reach a wider circle of readers than mere specialists. Furthermore, this work of Ove von Spaeth is inter-disciplinary to an exceptional degree based on extensive and thorough studies within history, theology, archaeology, and the history of religion as well as the history of astronomy. With zeal and flair Ove von Spaeth has collected evidence from widely different sources to support his main thesis regarding Moses and his status and place in history; and from the astronomical-historical point of view I find the basic assumption of a certain planetary constellation in 1537 BC worth testing in relation to biblical research Egyptology archaeology as well as general history. An extensive bibliography reveals extraordinarily thorough background studies. The entire account and its results deserve to be known also outside Scandinavia." "This work by Ove von Spaeth reassesses Moses' historic situation, and - if properly published and put into circulation - it could alter our current view of this historic sequence of events in the Near East during the last half of the second millennium BC. This is a well-articulated, thought-provoking text that is very enjoyable reading and which should interest any avid reader of ancient history for scientific and personal reasons alike. The writer presents a truthful, comprehensive presentation of his material - with no ulterior motives. The primary sources used here go far beyond those used in contemporary research; and his secondary sources, including the results of modern research all the way up to the present, are applied and discussed to an astonishing degree. Ove von Spaeth's work - the result of year-long efforts on partly unheeded problems up to now - not only constitutes serious historical research, but is a vivid historiography appealing both to scientific history research and ordinary readers interested in history." Naturally and as already referred to, Ove von Spaeth's research of the very Senmut star map and its chronological perspectives contains valuable data which were later taken into consideration in relation to his work on the investigation of the historical Moses and the era concerned. Illustrations. Below: Quarry with modern entrance to Senmut tomb TT353 - from where its hidden, long tunnel continues through the deep underground beneath Hatshepsut's temple. 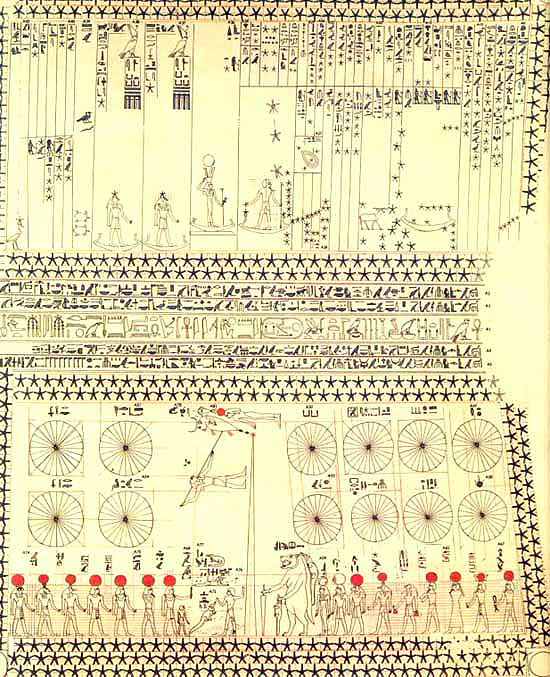 Further below: Senmut's astronomical ceiling from 'Chamber A' in his tomb, No TT353.